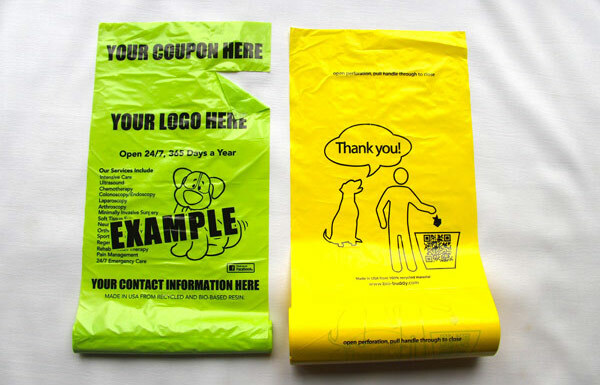 Classic Plastic’s custom dog waste bags create an opportunity to send a powerful advertising message to your customers and community! Dog owners are a loyal and desired group of consumers and this type of advertising creates an immediate connection to your brand. 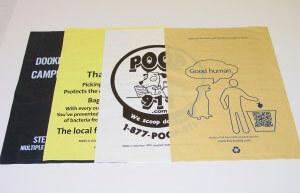 Custom printed dog waste bags can be printed for both waste station dispenser rolls and leash dispenser rolls. Selling community advertising on custom dog poop bags is a proven method that many communities and dog park care groups have used to eliminate the cost of the dog waste bags for their dog parks. Simply gather dog friendly advertisers in your community to be sponsors. The sponsors pay for the advertising on the dog waste bags and the personalized dog poop bags are donated for dog park use. Everyone benefits! Rescue groups have also used this idea with great success! The rescue group designs a bag with the group's logo and information. The bags are then sold to the members to raise funds for the group. A product that the dog owner regularly purchases becomes an income source for something they believe in. Again everyone benefits! There are endless opportunities for any group, organization or business to creatively advertise or create images on our custom dog waste bags! First put together your bag design. The bags are 8″ x 11.875″. We suggest keeping the design 1/2″ back on all the edges. Email us a vector file of your design and we will contact you to work through the details. If you have an idea for a design but need it put together, contact us, we can probably help. Once the design is completed and approved by you, we have the print plate made. You then decide the color for your bags. White, beige, and yellow bags are always available. The colors are designed to look good with the black or royal blue print. We can also work with you to get other colors you may need. 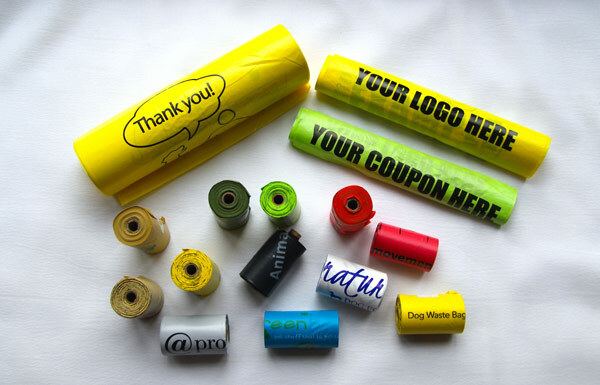 Custom printed dog waste bag are provided in rolls as small as 100 bags per roll. The bags are made in the USA for speedy order fulfillment. The whole process usually takes approximately 3 weeks. If you need a faster fulfillment time, contact us, it may be possible if you have completed artwork. All first time orders require a $100.00 printing plate creation fee. This is a one-time fee. The printing plate can also be used for future orders at no added cost. You'll need to contact Classic Plastics for pricing on the bags. White, Beige, and Yellow material is always available for both the 100% recycled resin biohybrid™ bags. Additional colors constantly change. Please contact us for current availability of colors and quantities. If we ship by USPS flat rate boxes, we can ship anywhere in the US, (including AK & HI) for $15.00 per case. We can pack 2,000 bags in a case.